Create engagement – instantly! Just add your own questions. Using game-like structures, Instant Engagement leads you and your students through step-by-step instructional strategies for review, thinking and discussion, idea generation and problem solving. There are 3 different programs in this series: 1) Pair, 2) Team, and 3) Class. Each program includes three structures designed to cover the range of classroom objectives. 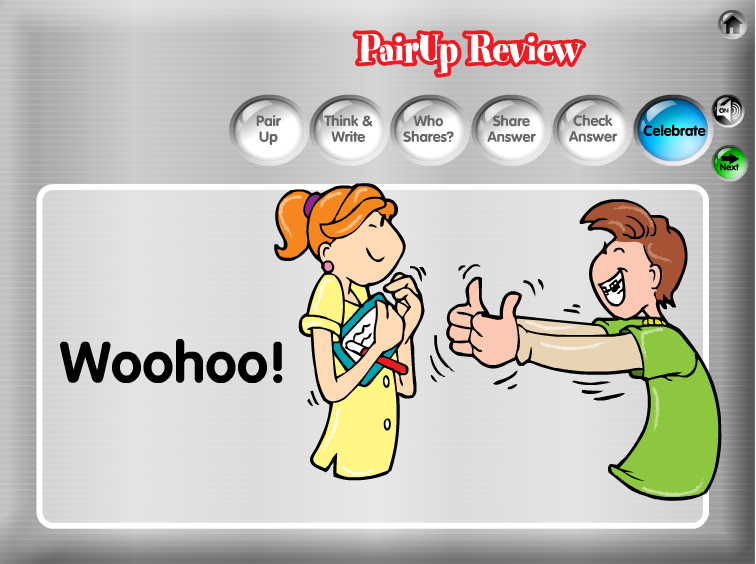 Use Quiz-N-Show for pair review sessions to boost test scores in any subject. 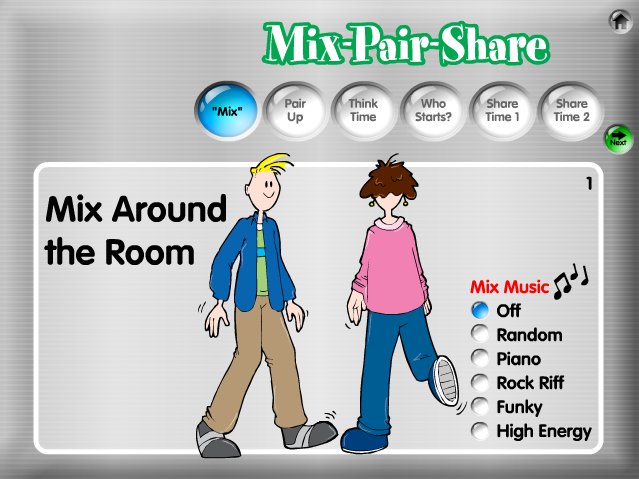 Use Mix-Pair-Share to have your students mix to the music and then pair up with a classmate to discuss the prompts you enter – from what they did last weekend to the Theory of Relativity. 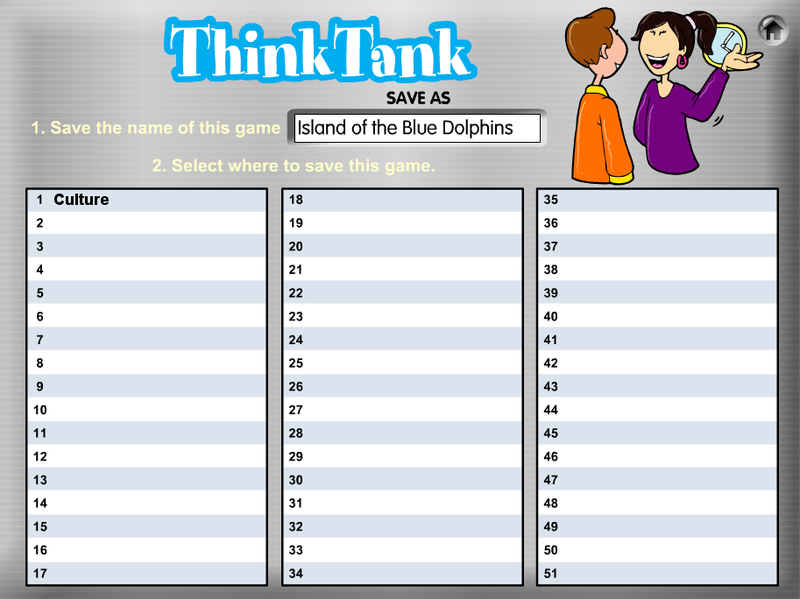 Use ThinkTank to promote higher-level thinking and in-depth discussions in teams about your curriculum. Learning becomes fun, not a chore with these inte ractive strategies. Good teaching is a snap! 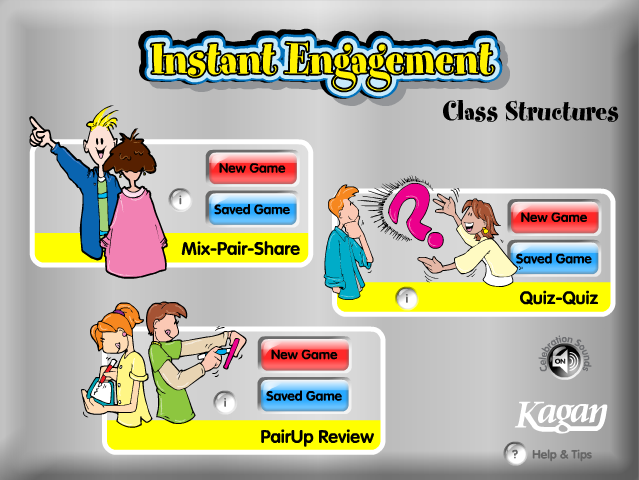 Whether you know and love Kagan Structures or you’re just looking for a way to step up student engagement in your class, you now have the perfect tools to engage every student, every time. Use with: Open–ended thinking and discussion questions. For example: What did you like most about the poem and why? Students mix in the class and pair up when prompted. A question is posted and both partners think about their response. One teammate is randomly selected to share his/her ideas. Then, the othe teammate shares his/her ideas. 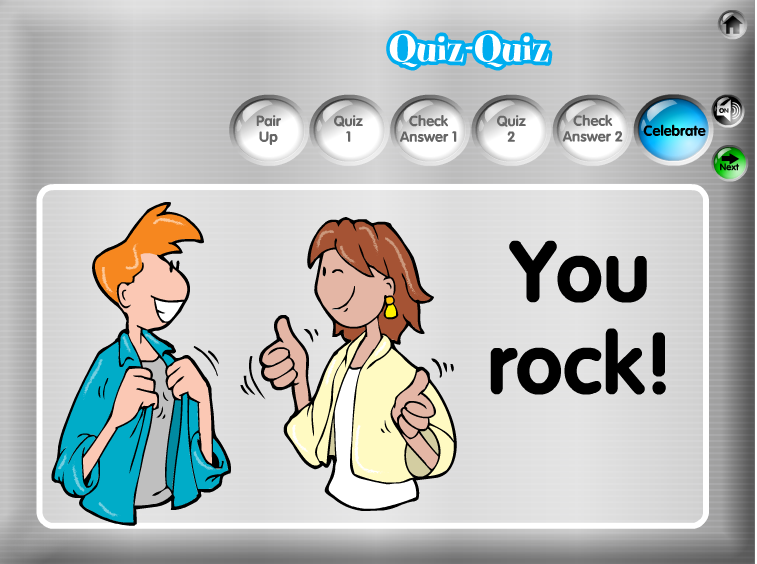 Use with: Flashcard–type quizzing questions with quick right or wrong answers. For example: Identify the part of speech of a word. Students pair up. 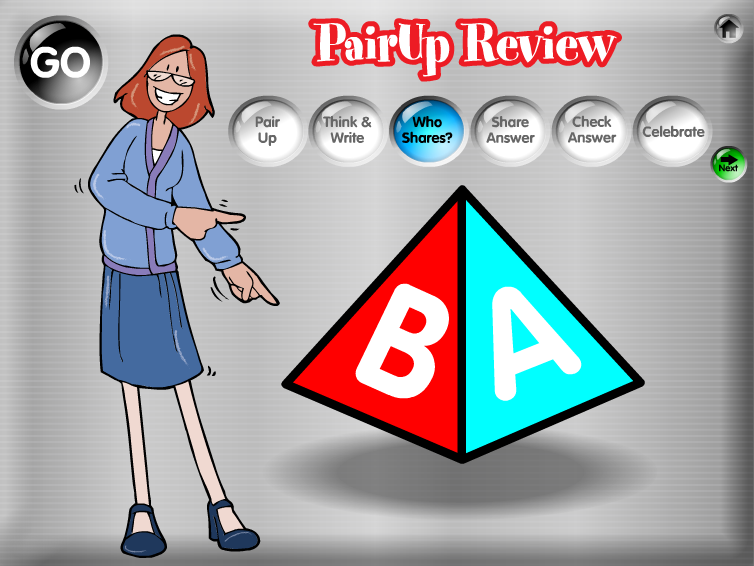 Using the posted question, Partner A quizzes Partner B. They check the answer against the posted answer. Partner B then quizzes Partner A and they check the answer against the posted answer. Students celebrate, then find a new partner to quiz with the next posted questions. 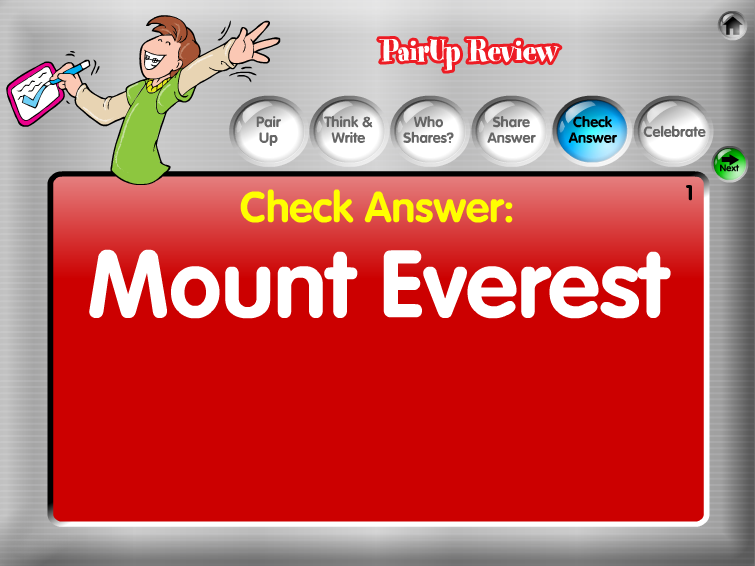 Use with: Right or wrong questions, review questions, or practice questions. For example: When was the Declaration of Independence adopted? Students pair up. A question is posted and both partners independently answer the question. 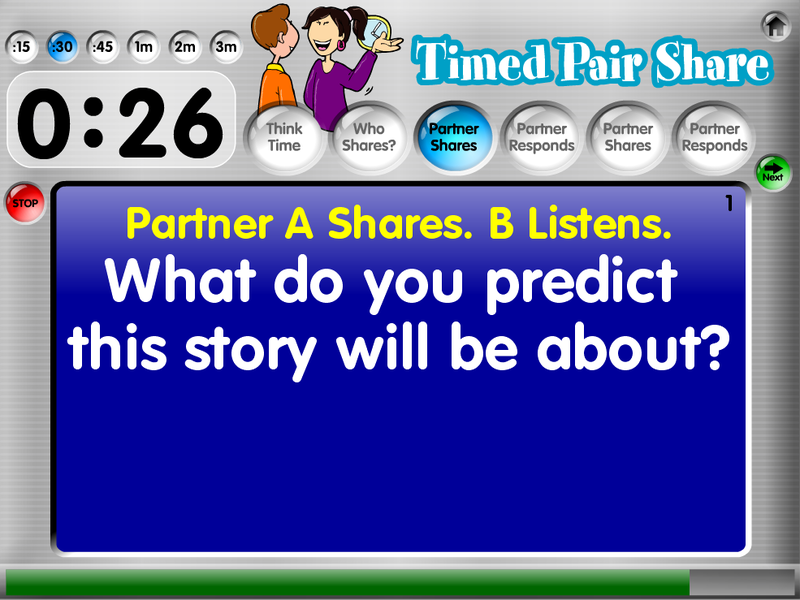 One partner is randomly selected to share the answer with his/her partner. Students check answers against the posted answer and celebrate.